By working the hand lens, you can see that it has changed a lot of characteristics, and it seems to be working in my favour. Photo 13. The top section is forming fairly easily, and the initial size that I had cut and selected to work with seems to be paying big dividends now. If I had made it too small at the beginning, I would have no " extra forming" material and depth to work with. I have started to make the lens somewhat concave and convex such as you would find in a magnifying glass. 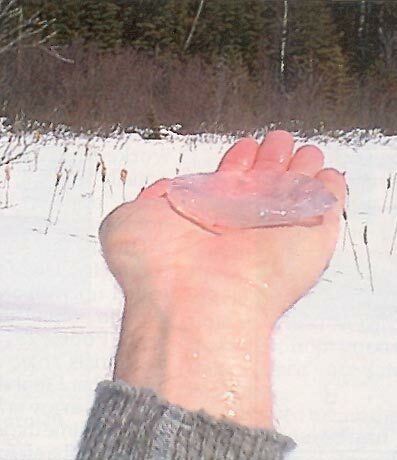 This was a real challenge using bush ice! This is what Photo 14 shows that I am trying to do. 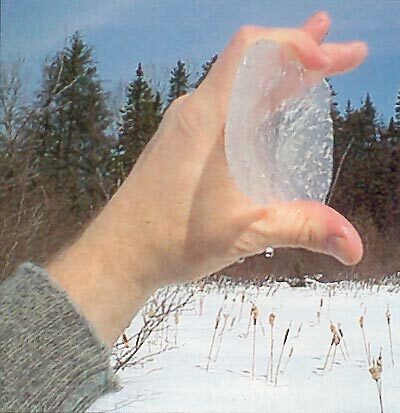 Using my bare hands, I am moulding the ice to look like what I think a lens should be like. However, this piece still seems a bit "thick." But, having it thicker is better, because I can always take some more of it off, but I can not add it back on. Keep in mind, it is a nice sunny day, and once I get the lens the right width and thickness, will the sun just melt it? I needed time to "fine tune" it also. I might not even get to make it work before its characteristics just melt apart in my hands. The whole concept of this project is to get the heat from the sun to pass through the ice lens and make fire. 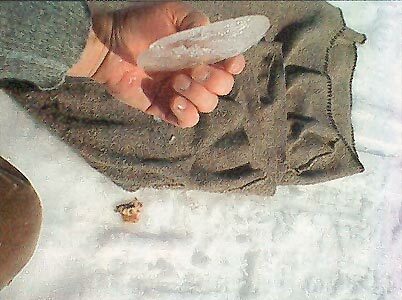 But, if there is sun, there is heat, and I am holding a piece of ice in my hand, as I try to craft it. It will reduce in size very quickly. I kept asking myself just how long before it actually disappears? 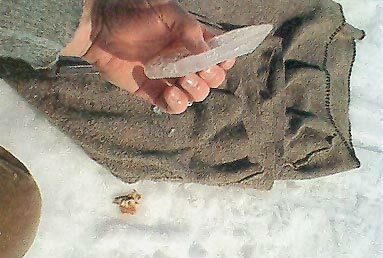 I decided to do an experiment to try to understand what I am exactly doing here, and to see how quickly the ice melts. 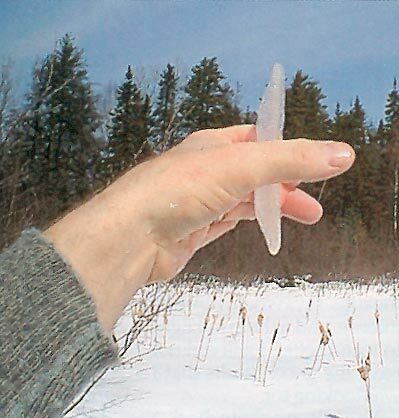 On a nice day, I went outside and held an ice cube in my hand to see how long it would last. Does it last long enough to work with? I tried this, to gauge my timings on the "crafting time," and maybe find my "fine-tuning time!" I had thought that perhaps you have just one try after you make your lens? Sort of a "pass or fail" of sorts! That did not seem to me like a good "option" when I am in the bush! 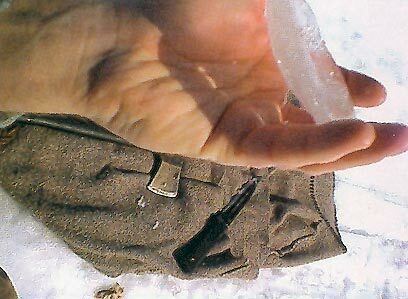 In Photo 15, you can see how I am crafting my ice lens; I am using the palm of my hand to mould the outer side of the lens like a "hard hat," while using the tips of my fingers to work the inner side. This way I can keep it smooth and even. This was favourable and maintained evenness, as the outside has just as many turns as the inside. Note: As I rotated my hand, the palm and finger work both sides at the same time. This kept everything even, and worked out very well. I am trying to display the depth that I am still trying to achieve, compared to the thickness that I have. You can see from Photo 16 that my hands and fingers are starting to be viewed on the opposite side. The clarity of the lens now seems to be clearing up. 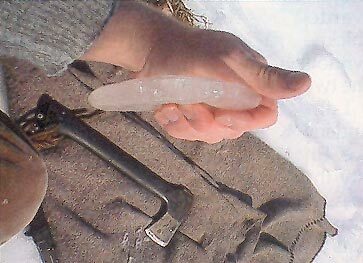 I tried to take my thumb and make the last part of the inner side, closer to the outer side, with just a small amount of ice between the two, and completing my "concave and convex" styling. Figuring, the thickness might affect the sun's rays, I wanted to reduce this thickness as much as I could without going right through the two parts. I am showing the outer and inner surface as you can see. Photo 17. You can see my thumb through the ice lens. With this photo, I can gauge the thickness that I was trying to achieve. In Photo 18, I have my desired depth and circumference that I need. I am trying to mould the lens so that I have the sides even all around. You can see from this photo that the lens has cleared up considerably since it had come out of a small pond. So, we have gained in clarity, and the lens is getting more molded in my hands, and all the while I kept figuring on how to keep it looking like a magnifying glass. It is starting to take shape -- it is not too big to be manageable, and is easy to craft at this point. I am trying to keep in mind a few points like the thickness at the end of it when I actually get to try it before it melts away. Photo 19. 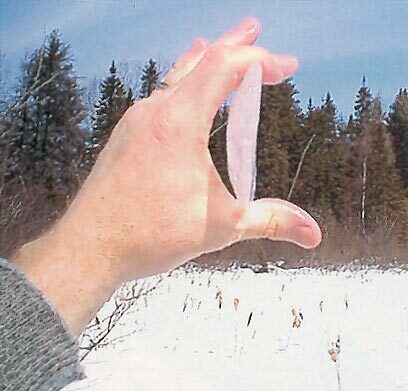 How much ice will the sun's rays actually pass through? Will it still be strong enough to make a fire? When I have it fine tuned, will just holding it on the tinder melt it away too quickly before it has had time to work? 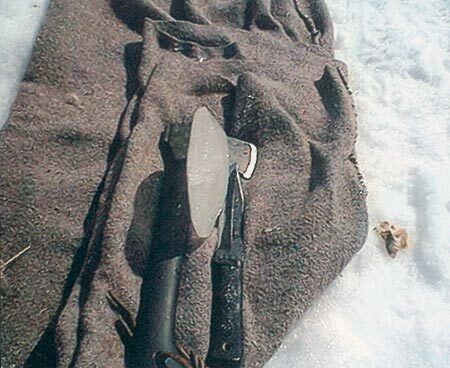 When you make a fire from ice on a hot day, there are many variables. 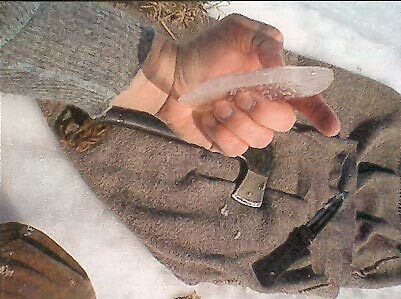 I continued to craft the lens while I figured out this particular piece of ice so that I could achieve its absolute best characteristics. I am trying to solve problems as I am working to save time and before my ice melts away. Photo 20. Time is a real factor against me now, and I cannot waste even one moment. Photo 21 shows what I figured to be a good series of dimensions for the fine-tuning stage. It fit well in the palm of my hand, and it was easy to mould. If you look at my hand closely, you will see a bead of water running down my hand in the lower middle of my palm. This indicates that it is indeed warm, and my ice hand lens is melting. If I had crafted it initially too small, there would be nothing left to use as a lens. You can see how I have tried to make the lens concave and convex at the same time, and keep the same thickness through the ice lens. Photo 22. This was the best way I knew of to make the lens even. The clarity at this stage has changed considerably since we pulled it from the pond. It looked pretty dirty initially, but now it does not seem too bad. In Photos 23, 24, 25, and 26, you can get some idea and understanding of the dimensions I had used, and what I was trying to achieve. I found that trial and error is the only way. 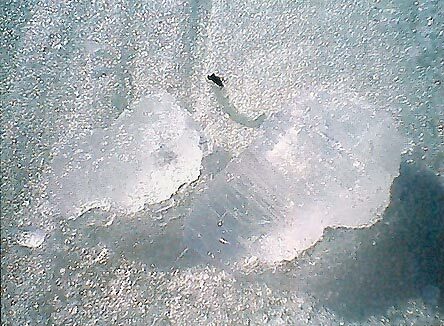 With this photo series, you can also see the clarity from this particular piece of ice, but you can also see the air bubbles within the ice. Can we use this to our favour, or will these have a negative impact on our lens focus? I wanted to see what "bush ice" could and could not do. I am trying to fine tune my lens, and with each try , I work the sun's rays through. Photo 27. Each time I seem to get closer to what I wanted, but it always just fell short of the goal. 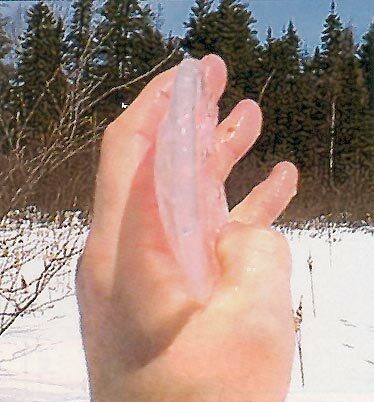 Every time I worked with the lens in the fine-tuning stage, the ice hand lens was still melting. In Photo 28, I tried to reduce the size of the lens a bit smaller in the hopes that the sun's rays would be more intense, and to help my light to focus better. I still did not have the good results that I was looking for. The air pockets had a definite effect on the lens. When the sun's rays would pass through it, would melt from one air pocket to the next and, spread rather quickly. I would loose a lot of ice. I thought each factor that worked against me was actually teaching me many good "options" about fire from ice. This is the size of the completed lens that I had ended up with after many experimenting and actual trials. Photo 29. In doing these trials, there are some things that I found that did not work in my favour. 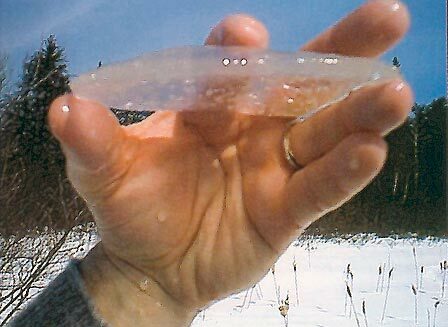 Each time the ice melted to a point, the air formations that I was left with, made a lot of little holes in the ice. This particular type of ice melted a lot quicker. I would also lose the intensity of the sun's rays. However, in fairness, the little air holes had some advantages too. I learned something very valuable from those air holes, as you will see later in my articles. Also, I had found a great "option." 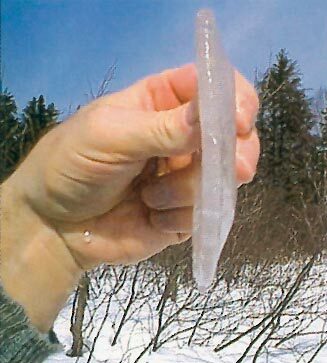 I found that this particular depth of ice would melt quicker than expected. 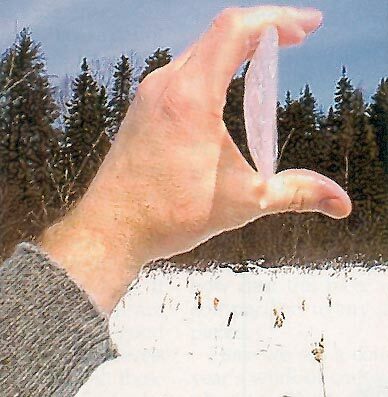 The place that you take your ice piece from will help with the eventual ice lens clarity. The shape of the lens and the sizes will give different results on the focus of the sun's rays. 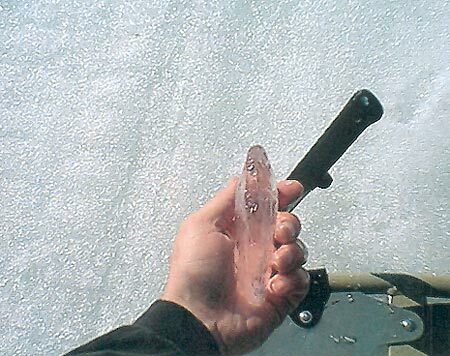 The air pockets you find in some ice will offer little clues to the secrets in finding the fire from ice skills. The time of day that the ice lens is crafted and tried will make a difference. 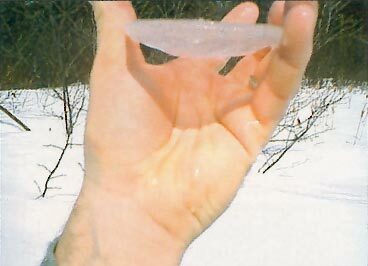 The winds have a definite effect on the ice lens's longevity. In Photo 30 are some of the pieces I collected from the different spots on this river. Some were from faster waters, and some were taken from different depths of water. Some of these pieces were crafted from different depths in the same hole. 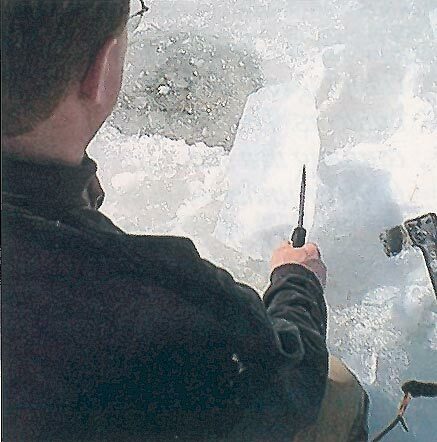 If you watch when you are cutting the ice from a good source, check the many levels of formed ice. Within these levels there will always be some really good layers. Go through these layers, select the best, and try to craft from these layers first! They are great starters. I have continued on with roughing out the lens by hand to where I think it might offer me the best characteristics. Photo 31. 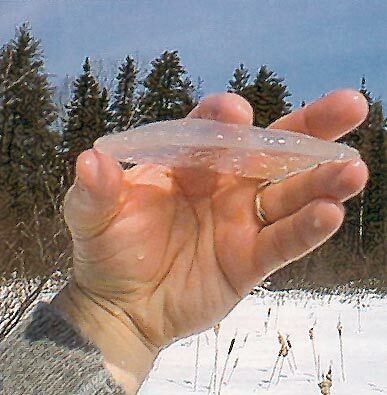 This particular lens is relatively clear, and the ice was good for shaping. 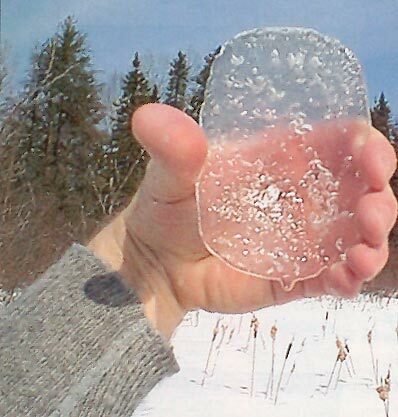 With the ice lens on its side, you can still see through it. It offers you a chance to see just how clear this piece was in comparison to my earlier pieces. Here we see a couple of year's work of crafting and playing. Photo 32. This photo shows clearly that the lens is small and manageable. The sun's rays focus much better, and the lens is a lot clearer to allow for a good angle and the sun's rays focus. The angle with this lens, which is hard to see, is actually steeper within the lens itself. I did achieve a better lens in increasing the angle to a steeper focus. Then, the day came when my lens was as fine as I have ever crafted it. As luck would have it, the clouds were rolling in just as smoke was beginning to rise from my fungus tinder. But, this happening the way it did, was a blessing in disguise. I had to think about this. I thought fire from ice was a block of ice formed into a lens. Now I had to see if there were more "options" to this great skill, and perhaps an easier more practical way to make it work. With all the lessons that I learned thus far, some new ideas that I thought out from making each and every lens, and the years of trial and error, I wanted to make it as practical and functional as possible.